Hurricane Harvey first made landfall as a Category 4 storm near Rockport, Texas, on the evening of August 25, 2017. The storm has since devastated communities in both Texas and Louisiana, claiming many lives, inflicting countless injuries, destroying or damaging tens of thousands of homes, and causing billions of dollars in damage. Authorities raised the death toll from the storm to 50 as the latest statewide damage surveys revealed the staggering extent of the destruction. The Texas Department of Public Safety said more than 37,000 homes were heavily damaged and nearly 7,000 were destroyed, figures that did not include the tens of thousands of homes with minor damage. Mirroring the sentiment of our founders - taken from the Declaration of Independence “With a Firm Reliance on Divine Providence” - President Donald Trump recently issued a proclamation designating September 3, 2017, to be a National Day of Prayer for the victims of Hurricane Harvey and national response and recovery efforts. This call for prayer from the Chief Executive of these United States is not only constitutional, it is his duty. You see, the first role of the President of the United States is to ensure the safety and protection of the People. Doing so requires the aid of our Creator and benefactor of those rights that every individual, regardless of party or creed, cherish. Our dependence on the God of Heaven is what created, preserved and keeps us united as Americans. Evidence of this can be found in the so-far 144 national calls to prayer, humiliation, fasting, and thanksgiving by United States presidents since 1789. There have been 67 Presidential Proclamations for a National Day of Prayer with many presidents signing multiple National Day of Prayer Proclamations in the same year. Please understand this is not just a Presidential thing either. 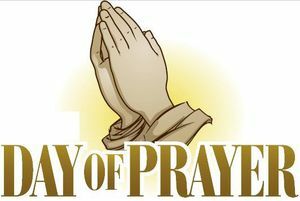 The website nationaldayofprayer.org notes that records indicate there have been 1,419 state and federal calls for national prayer since 1775, and counting. This, of course, includes Texas Governor Abott’s recent statewide call for prayer. I conclude this week by asking all of you to continue to pray for the victims and good Samaritans alike of this national tragedy. That the benevolent sovereign power of the Christ King would continue to help, and restore our hearts to His aid and comfort.